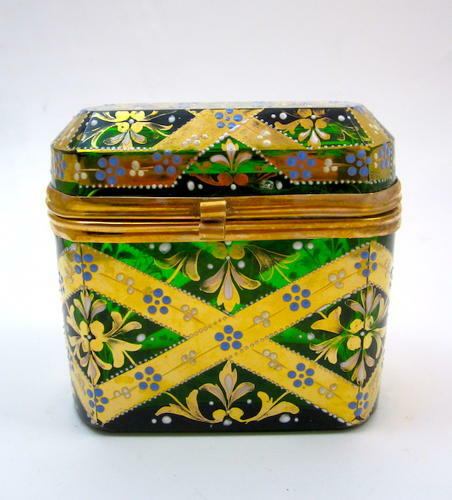 Stunning Antique MOSER Glass Casket with Typical Moser Hand Painted Design. This Casket is Three-Layered Cased Glass. Alternating Green and Gilded Panels are Decorated in Composite Gold and Enamelled Blue and White Flowers. His Signature Designs are his Use of Applied Glass Acorns; Polychrome Enamelled Oak Leaves , Flowers, and Butterflies, Enamelled Bugs and Applied Grapes Formed from Glass `Jewels'.